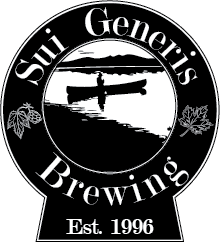 Sui Generis Brewing has moved to a new website, located at http://www.suigenerisbrewing.com. No additional posts will be made here at blogspot and commenting has been disabled. I encourage you to redirect your RSS feed to the updated feed, and to update your bookmarks. Dissolve DME, yeast nutrient and Fermcap S into the water; once compeltely dissolved slowly add the agar while stirring, being careful to avoid lump. Steralize for 15min in a pressure cooker at maximum pressure, or by simmering for 5 minutes. Cool to 60-65C/140-145F and pour into sterile plastic or glass petri dishes. Collect or prepare wort at a gravity of 1.020 to 1.040. Dilute to 1.002-1.004 (1:10 dilution of 1.020 to 1.040 wort). Add Firmcap S (optional) and 2% agar by weight to the diluted wort. Sterilize and cast as described above/in the video. To reduce the growth of brewhouse bacteria such as lactobacillus a wort with a final (i.e. post-dilution) hop alpha acid content of at least 10IBU can be prepared. Dilute some collected wort to 1.020, or or prepare 1.020 wort from DME. Boil sufficient high alpha-acid hops in the wort to achieve at least 50 IBU (preferably 75-100IBU) of bitterness. Dilute 1:5 (gravity of ~1.004, min 10 IBUs) and prepare as with "Wort-Agar (from wort)", above. Grate 50g of potato, with skin, into a small sauce pot. Add 100ml of water and bring to a simmer for 30 minutes. Strain the potato extract through a fine-meshed wire strainer - if clearer plates are required additional filtration through cheesecloth or a coffee filter can also be performed - warning: this will be extremely slow and is generally unnecessary. Next, dissolve 2%/weight (2g/100ml) of dextrose (corn sugar) or another fermentable sugar like table sugar (sucrose) into the potato extract. Then slowly stir in 2%/weight agar, being careful to avoid agar lumps. Steralize and cast as described above/in the video. To get hopped PDA, pre-boil the hops in the water later used to boil the potatoes, aiming for 10-20IBU. Then prepare the plates as per PDA (above), using the hopped PDA. Cycloheximide: an antibiotic, available from some scientific supply companies, which selectively kills Saccharomyces, but not Brettanomyces or brewhouse bacteria. Make a 100X solution (10mg/ml), and dilute 1:1000 into agar immediately before casting. DO NOT presurecook/boil this reagent. CAUTION: This is a potential carcinogen and is highly toxic, so wear appropriate safety equipment and avoid exposure. Pen/Strep (100X): This is a mixture of penicillin and streptomycin, antibiotics which when combined will prevent the growth most (all?) beer-contaminating bacteria. Very useful for separating Brett/Sacc from wild/sour fermentation. Dilute 1:100 into media immediately before casting plates - do not boil/pressurecook this reagent. Addition of 75g/L table salt (sodium chloride). This should result in a medium which allows for the growth of halotolerant lactobacilli, which would include Pediococcus and Lactobacillus. Be sure to use kosher, pickling, or otherwise non-iodated salt only. Replacement of dextrose with lactose in PDA media. This should create a medium which allows for the growth of all Lactobacilllus species, a some species of Pediococcus, and some strains of Brettanomyces. No Saccharomyces should not grow on this medium. Copper sulfate. When added at a rate of 0.6g/l this should impair the growth of non-Brettanomyces yeasts. There are a number of bacterial and fungal medias available from commercial sources - YPD (yeast peptone dextrose) being a commonly used media for yeasts and de Man, Rogosa and Sharpe (MRS) a commonly used medium for lactobacilli. While excellent medias, these tend to be expensive and offer only minor advantages in terms of ease-of-preparation and growth quality. But more to the point, PDA is broadly recognized as the preferred medium for the growth of food-relevant fungi and lactic acid bacteria - indeed, it is a medium recommended by the FDA and by numerous food-inspection agencies for enumerating fungi and lactic acid bacteria in food and cosmetics. So save yourself some green and use what the pro's use - potato-sugar-water! This series has been a great source for setting up my home lab so firstly I just want to say thanks. Now for a question regarding the potato. I came across potato starch in the store, not potato flour. I was wondering whether this couldn't replace the whole cooking of the potato. Question is how much would you substitute for the 50g of raw potato. Also help with filtration. No, starch will not work. The potato is providing a lot of things other than starch; various vitamins and nutrients, plus a nitrogen source. Pure starch will lack all of that (flour, presumably, will not - but I haven't tested that option). I you want to use starch in place of potato you will need to replace all of those nutrients - using a complete yeast nutrient (e.g. servomyces) may work, but I've not tested it so I cannot say for certain. Is there a way to substitute the dry malt extract with something which can be found at any house or quite in general? Love your blog. Even with the use of a flow hood and autoclaving I'm haveing a small bit of contamination, viewed at 1000x. A few rods and some very tiny guys that move somewhat. I'm interested in trying pen-strep. Is this available in Canada to the public? If you are getting contamination under these conditions you likely have a contamination somewhere in your hood that is being blown onto your samples. I'd recommend cleaning the hood thoroughly. Bioshop Canada may send it to a home address, but I am not certain. Sui Generis - literally "of its own genus" (of its own kind), is my goal for my brews. This blog serves as both an opportunity to share my brewing experience with the outside world and will hopefully interest others in the homebrewing of beer, mead, cider, wine and other things. Will Wheaton - He Homebrews!!! Feel free to use anything you find here - just reference where you got it.. Picture Window theme. Theme images by peepo. Powered by Blogger.